I’ll be participating in a panel discussion at NYU tonight from 6:30 to 8:30 (at 19 University Place, Room 102), along with chefs and other writers. The topic: “Chefs and their Publics.” Sounds a bit academic, I know, but the panelists are good and the discussion should be lively. I know I'm going to do my best to be fascinating. And I’m told there might be Room4 (hint hint) a surprise extra guest speaker. Tom Colicchio spent the night of this season’s Top Chef finale at Pier 60 on the Hudson River, at the annual C-CAP benefit. I know because I saw him there. I took his picture and spoke with him briefly, too. Someone tried to introduce us, Rita Jammet, maybe, or Drew Nieporent, but we’d already met. “Sure, I know Bret. He likes to say very mean things about me,” he said. He was referring to my attack on Top Chef, a show that I barely watch but whose fans get on my nerves by showing up at food events and being the idiotic groupies that they are. Well, that some of them are. Most of my friends watch Top Chef and they’re not idiotic groupies at all. I sort of tried to explain myself to Tom, but he just smiled and graciously waved it off, in the way that you do when you don’t really care when someone quibbles with you, or when you’re Tom Colicchio and the ramblings of a little guy like me matter not a whit in your life. 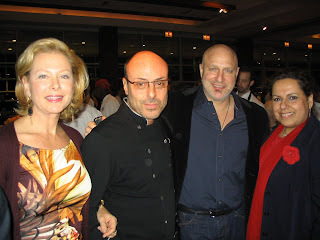 At any rate, I took a picture of Tom, third from the left, along with consultant and cookbook author Pamela Morgan, Gotham Bar & Grill chef Alfred Portale, and Rita Jammet, who with husband André owned New York landmark La Caravelle for many years. Now her son Nic is a partner in Sweetgreen, a fast-casual salad and frozen yogurt shop in Georgetown. She said they’re adding new units at Dupont Circle and in Bethesda, Md. The C-CAP benefit is one of the great events of the New York food scene. It’s an excellent cause — funding and nurturing at-risk students pursuing careers in culinary arts — and so many of the city’s great chefs and restaurateurs show up rather than sending their minions. The food is great, the crowd is fun, and even the wine is usually pretty good. So I caught up with Ben Pollinger at Oceana, who has a newborn at home, so congratulations to him, and Marc Murphy of Landmarc and Ditch Plains — he says business at Ditch Plains in particular is booming, especially the bar. Marcus Samuelsson saw me fussing with my camera, so he took it from me and took quite a good picture of me and Wylie Dufresne (that’s us on the right; Wylie’s in the apron, I’m the little gnome over whom he’s towering). Drew Nieporent’s hoping this will be his year at the Beard Awards. I think he’d particularly like Corton to be named best new restaurant. Drew’s also on the long list of semifinalists for Outstanding Restaurateur, but he said he didn’t much care about that, and that everyone on that list would be a worthy winner. A C-CAP spokeswoman told me they wouldn’t be discussing how much money was raised this year, but rather stressing how great it was that the whole chef community participated in the effort. She didn’t correct me when I assumed that that meant receipts were down. Of course they’re down. Business is lousy. One fine dining chef did tell me he was starting to see light at the end of the tunnel — that after an abysmal January saved only by restaurant week (or really fortnight), some people are gradually shifting back from the cheap-o prix-fixe menus and ordering with a bit more gusto. After all, New York still does have a large moneyed class, and they can only refrain for so long from drinking deeply from the cup of life. Tony and Marissa May were at the event, and they said construction on SD-26, the successor of their recently closed landmark restaurant San Domenico NY, was coming along. Michael Lomonoco of Porter House introduced me to his longtime chef de cuisine, Michael Ammirati, with whom he’s worked since they were at Windows on the World, as he handed me a slider. Michael's on the right in this picture, and that’s not ordinary schmootz on his forehead; yesterday was Ash Wednesday. Oh, speaking of sliders, I had a tiny pork belly slider from Aureole, where Chris Lee is the new executive chef. Chris wasn’t there when I was, but I got to the party late as NRN’s culinary pages closed last night and I, naturally, had to stay until they were ready to ship. Still, I had plenty of time to nibble my way through the C-CAP festivities and still make my 9pm reservations at Inakaya. It’s a Japanese robatayaki place near Times Square (in the New York Times building, in fact), part of a Japanese chain, and I think it very much belongs in Times Square. It’s a gigantic space with a lot of yelling. Yelling — or at least speaking with great enthusiasm and gusto — is par for the course in proper Japanese restaurants, where it’s customary for everyone on staff to greet you with a hearty Irrashaimase! when you arrive. It’s terrifying when you’re not used to it, but then it becomes kind of sweet. They similarly yell to you when you leave. But at Inakaya they yell about everything. If you order something, the server shouts out the order and the guys preparing the food behind the bar repeat it. It kind of reminded me of Cold Stone Creamery and the way they all have to sing with great enthusiasm anytime someone drops something into the tip jar. 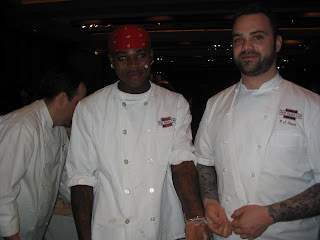 To finish off this blog entry, here are some guys with tattoos, from the culinary staff of Union Square Cafe. On the left is chef tournant Louis Opoku. 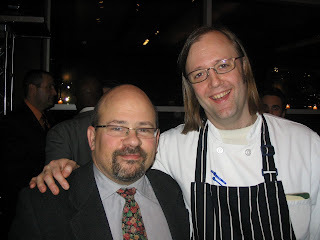 Executive sous chef T.J. Steele is on the right. Last night I tried to get Missy Robbins to say nice things about Chicago, but I couldn’t do it. Missy was the chef at Spiaggia in the Windy City for five years or so, working under chef-owner Tony Mantuano. But she’s from the New York area and is clearly very happy to be back. She has a good job. She’s been the chef at the critically acclaimed A Voce for about the past six months, replacing Andrew Carmellini, who left late last spring. I ate there last night with one of her publicists, young John Weiss from the Susan Magrino Agency. I don't think John would like me to call him young, as he is a five-year veteran of the New York PR world, where five years is a lifetime. And he’s spent it all at the same agency. But I mean, come on: He’s 27. Nice guy, though. Good dining companion. I have always found Chicago to be a great restaurant city and I told Missy so, but she neither agreed nor disagreed with me. I asked if she missed it, and she said she thought Spiaggia was a great place to work and that Tony Mantuano was still a good friend of hers. I imagine New York’s as glad to have her back as she is to be here. Ricotta di bufala with extra virgin olive oil, mint, thyme, chiles and thick crusty bread. I had an interesting chat this afternoon with Brasserie manager David Pogrebin, who is going through a lot more doggie bags than he used to. And a wider variety of people are using them, and taking home less desirable items than they used to. Brasserie has a big rib-eye, so it has never been uncommon for people who didn’t arrive in chauffeur-driven cars to take half of it home with them. But now, people of all walks of life are taking food home, David says, and not just eight ounces of steak. They're taking home a couple of extra bites. If all that's left is the French fries, they take the fries home (like anyone really wants day-old fries). Regulars who didn't used to ask for doggie bags are asking for them now. The super-rich are doing it, too, and explaining themselves when they do it, David says. “I’m taking this home for my wife,” for example, like David cares why they're taking it home. We talked about that for a bit, and I think maybe the customers are bragging — showing their thriftiness now that that's considered a positive quality and a sign of good character rather than an indication of miserliness and ill-humor, which is what many people thought it was eight months ago. I’m asking around to see if this is a significant trend, and I’ll start by asking you, dear blog reader, if you use doggie bags more often? (There's a poll on the right side of this blog. Click on the 'yes' or 'no' button if you feel so-inclined). I'm collecting interesting ideas for things to do with lardo, as my boss is writing about it. If you'd like to share your thoughts, please do so by commenting below. She's particularly interested in learning what professional chefs are doing with it, but anyone should feel free to comment. My fault: The results of the latest poll are kind of confusing, because I let participants tick as many boxes as they wanted, and they ticked an average of 1.52 of them. I was curious to know what kind of crossover there is between Food Writer’s Diary readers and readers of its parent, Nation’s Restaurant News. I learned that 28 percent of the 25 participating poll takers don’t read NRN at all, but that 60 percent do read it (assuming that no one said that they read NRN primarily both online and in print). And that 16 percent of those who read it read it in print. Two respondents — that’s 8 percent — said they usually read it at home. Anyway, the results are below. I’ll post a new poll sometime soon. If you're going to be in New York on Friday, February 27, and you’re not doing anything else between 6:30 and 8:30 PM, you might enjoy this event, involving chefs and writers talking about food and words. I’m on the panel, and I know two of the other panelists, Dan Barber and Heather Carlucci-Rodriguez, are articulate people with interesting things to say for themselves. In fact, I've been on panels with them before, separately, and we’ve always had a good time. The fourth panelist, Frederick Kaufman, I’ve only met briefly online, but he was congenial enough, and certainly seems like an interesting guy. I think it should be a fun evening. Restaurants take a lot of heat from public health advocates who accuse them of fattening up the American population. Restaurants tend to respond that they're serving customers the tasty food that they enjoy in the portion sizes that they demand. And it turns out that it’s not just restaurants that have been serving up bigger portions (until the past two or three years, say, when different-sized options have become more readily available in restaurants). It turns out that, according to this article from the Associated Press, that cookbooks are doing it, too. Okay, mostly The Joy of Cooking is doing it. Their portion sizes have gotten larger just like restaurants' have. I love The Joy of Cooking, by the way. If you need to know how to cook something, that book will tell you. You’ll likely have to tweak the recipes, but the basic technique is there. To win a restaurant award from the James Beard Foundation you need to jump three hurdles. First, a judge must nominate you. Next, you must be among the top five (or sometimes six) vote getters among those nominated. Then you need to get the most votes from that group. Until last year, no one knew who passed the first hurdle. But in 2008 someone leaked the preliminary list, and it was published all over the Internet. This year, the Beard Foundation seems to have decided to manage the story themselves and released the list to the media. Well, anyway, to me the list looks like a list of any chef, restaurateur, restaurant or wine or spirits professional who was nominated by any judge, but it could have been whittled down by the various committee chairs. I haven’t asked. In most categories, the same people, more or less, are nominated every year until they win. The winner is taken off the list and a replacement is named. It's not unusual for four out of five nominees in a category to be named two years in a row, and it seems to me that three out of five is pretty much the norm. That’s not true for best new restaurant, of course. For the “rising star” award, given to someone aged 30 or younger, most chefs who are nominated cross the age barrier before they win. This year, four out of last year’s six nominees are on the long list. Gavin Kaysen of Café Boulud won, so he's not on the list anymore. I guess the other nominee, Matt Molina of Mozza in Los Angeles, got too old. I’m going to go ahead and predict that last year's other four nominees will be back on the list. They’re Nate Appleman of A16 in San Francisco, Sean Brock of McCrady's in Charleston, S.C., Johnny Monis of Komi in D.C., and Gabriel Rucker of Le Pigeon in Portland, Ore.
They’re going to need to be joined by one other nominee, and I’m going to predict that it will be Aaron Deal of Tristan in Charleston. That will mean two Charleston chefs and no New York chefs will be on the list, which is weird, but Aaron’s getting a lot of good press and since many of the judges are the press, media attention is a good predictor of nominees as well as winners. That’s my approach in the predictions below, too. In no way does it reflect my opinion of the chefs nominated. I simply have noticed over the ten years that I have been covering the Beard awards that most nominees get renominated and the ones with the best name recognition win. Best new restaurant is a tossup, because of course none of them could have been nominated last year. But I'm going to predict that Corton in New York, L20 in Chicago, Momofuku Ko in New York, The Bazaar by José Andreés at SLS Hotel at Beverly Hills in LA, and Bottega in Yountville will be on the list. Let me reiterate that these are not my choices. These are my predictions of who will be on the list. For outstanding restauratuer, we have as returning nominees Tom Douglas in Seattle and Richard Mellman in Chicago. I think they’ll be joined by New York restaurateurs Kieth McNally and Drew Nieporent, and, mmm. I’m not sure about the last nominee (well, obviously I’m not sure about any of them, but you know what I mean) I’m going to go ahead and guess Stephen Starr in Philadelphia, but if Pano Karatassos in Atlanta gets the nod, I won’t be surprised. Outstanding chef went inevitably to Grant Achatz last year. José Andres in DC., Dan Barber in New York, Suzanne Goin in Los Angeles and Frank Stitt in Birmingham are on the long list again and I think they'll make it to the short list. All of the usual suspects are on the long list, but Tom Colicchio recently returned to the kitchen in New York with Tom: Tuesday Dinner. I think that and his Top Chef star power will be enough for him to get the nomination. For outstanding restaurant, Boulevard in San Francisco and Jean Georges in New York will be back on the list. I think they will be joined by Fore Street in Portland, Maine, Blackbird in Chicago and Bacchanalia in Atlanta. For pastry chef, I think Gina de Palma of Babbo in New York, Pichet Ong of P*ong in New York, Nicole Plue of Redd in Yountville, Calif., and Mindy Segal of Mindy’s Hot Chocolate in Chicago will be back on the list. Let’s see, that’s two in New York, one in Napa and one in Chicago. I’m going to guess that the last finalist will be in Las Vegas: Kamel Guechida of Joël Robuchon at the Mansion at MGM Grand Hotel & Casino. Three of last year’s nominees for outstanding wine service are on the long list and I think they’ll all make the cut: Bin 36 in Chicago, Blackberry Farm in Walland, Tenn., and Picasso at the Bellagio in Las Vegas. I think La Toque, the only restaurant on the long list located in California’s wine country, will get the cut, then the only New York potential nominee, Le Bernardin, will round out the list. Moving on to wine and spirits professional, Dale DeGroff and Merry Edwards are on the long list and so will likely make the short one. I think Garrett Oliver of The Brooklyn Brewery will join them, along with Todd Thrasher of Restaurant Eve in Alexandria, Va., and John and Doug Shafer of Shafer Vineyards in Napa, Calif.
For outstanding service, Canlis in Seattle, Spiaggia in Chicago and Vetri in Philadelphia will be returning nominees. Campanile in Los Angeles will be on the list, too, because Beard judges love Campanile. I think Daniel in New York will be nominated, too. Okay, now for the regional awards. Returning: Cathal Armstrong, Restaurant Eve, Alexandria, Va.; Jose Garces, Amada, Philadelphia; Maricel Presilla, Cucharamama, Hoboken, N.J. , and Cindy Wolf, Charleston, Baltimore. There's room for just one newbie, and I'm going to guess Jay Caputo of Espuma in Rehoboth Beach, Del. Joining them I'm going to take a stab in the dark and guess Gerard Craft of Niche in St. Louis. I find it interesting that Graham Elliot Bowles didn’t even make it on the long list. I doubt that reflects on him, but I’m not sure what it does reflect on. At any rate, on the long list, and probably on the short list: Bruce Sherman, North Pond, Chicago; Michael Symon, Lola, Cleveland; and Alex Young, Zingerman’s Roadhouse, Ann Arbor, Mich. I think joining them will be Paul Virant of Vie in Western Springs, Ill., and Curtis Duffy of Avenues at the Peninsula Chicago, but it could really go a bunch of different ways. Returning: Michael Anthony, Gramercy Tavern; Terrance Brennan, Picholine; Wylie Dufresne, WD-50; and Gabriel Kreuther, the Modern. I think Michael White of Alto will be the fifth nominee. Returning: Rob Evans, Hugo's, Portland, Maine; Clark Frasier and Mark Gaier, Arrows Restaurant, Ogunquit, Maine;, Michael Leviton of Lumière in West Newton, Mass., and Mark Orfaly of Pigalle in Boston. For the fifth nominee, I'm going to predict Michael LaScola of American Seasons, on Massachusetts island of Nantucket. New to the list (or really back on it as he has been nominated many times) I think will be Joseba Jiménez de Jiménez of The Harvest Vine in Seattle. Returning: Hugh Acheson, Five and Ten, Athens, Ga.; Arnaud Berthelier, The Dining Room at the Ritz-Carlton, Buckhead, Atlanta; Linton Hopinks of Restaurant Eugene in Atlanta and Mike Lata of Fig in Charleston, S.C. I think they’ll be joined by Bob Waggoner of Charleston Grill in Charleston, S.C. Returning: Saipin Chutima, Lotus of Siam, Las Vegas; Sharon A. Hage, York Street, Dallas; Ryan Hardy, Montagna at the Little Nell, Aspen, Colo.; and Andrew Weissman, Le Rêve, San Antonio. Returning:Zach Bell, Café Boulud at the Brazilian Court, Palm Beach, Fla.; John Currence, City Grocery, Oxford, Miss. 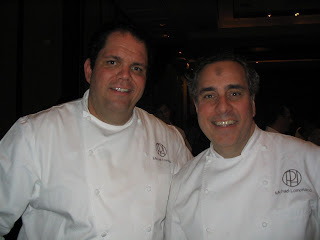 ; Christopher Hastings, Hot and Hot Fish Club, Birmingham, Ala.; and Douglas Rodriguez, Ola, Miami Beach, Fla. I think Scott Boswell of Stella! in New Orleans will round out the list. For the entire long list click here. Last night Forge restaurant celebrated its renaming as restaurant Marc Forgione. The name change had to do with some sort of trademark or copyright dispute that I didn’t follow due to lack of interest. At any rate, it was a good party, with ham (described as prosciutto, but I don’t think it was) from what someone called Marc’s own pig, as well as duck sliders, other little passed hors d’oeuvre and a selection of artisan cheeses whose producers or distributors were there to tell us about them. One of them, an American whose relatives in the Italian region of Abruzzo made farmstead sheep milk cheese from their homes and hired him as their distributor, said what I used as the title of this blog entry. Because Marc’s dad is Larry Forgione (the e is silent), one of the founders of the American cuisine movement and one of the most respected chefs in the country. He is not normally called Marc’s dad. Marc is referred to as his son. But times do change, and I don’t think I’d ever seen most of the people who were at the party. I did know some of them, though. I caught up with Arlyn Blake, social networking maven of the traditional sort, in which people are introduced personally to one another and might become actual friends rather than the Facebook variety. And I hung out with Food & Beverage editor Francine Cohen and Restaurant Business food editor Pat Cobe. Someone asked if Pat and I weren’t competitors, and we are, but that doesn’t mean we can’t have fun at parties together. You can be a competitor without being a jerk. The always-engaging Chris Shott from the New York Observer was there. His birthday was yesterday, or maybe today. He’s 33, the same age as Jesus when he was crucified. Chris said some of his friends said they hoped this Easter was better for him than it had been for Jesus when he was 33, and I pointed out that, in fact, Jesus had a terrific Easter as that’s when he rose from the dead (if you believe such things). Good Friday was the problem. I caught up with photographer Michael Harlan Turkell, too, who says he has been photographing Bushwick taquerias. Of course, there was talk of the economy. One person, who is in the unfortunate position of running a company that provides temporary catering staff when companies need them — needless to say, business is down a lot — was complaining that it was no longer socially acceptable to have any sort of gathering that might require the spending of money so guests can sit down to a meal. It’s true that such behavior is out of fashion, but if your company has just been the recipient of bailout money, it’s understandable that they would be disinclined to be ostentatious about their spending. It’s too bad they hadn’t thought about that before handing out huge bonuses. I know the economy is stimulated by spending money, but spending money you don’t have is how we got here in the first place (among other things, I know). Earlier in the evening I was extremely politically incorrect when I asked when we could start referring to the current situation as a depression. Wow, that’s a gloomy way to end a blog entry, so let’s bring the situation into perspective. A couple of weeks ago I went to a party at the New York Palace hotel, at which members of the Dorchester Collection — a group of hotels to which the Palace belongs — presented cocktails and mocktails for us to sample. You’ll have to ask someone else about the mocktails, but the cocktails were all distinctive and interesting, ranging from a Prickly Pear Margarita from The Beverly Hills Hotel to a fairly classical Martinez from The Dorchester in London, to the Palace’s Bourbon Smash (Bourbon, mint, lemon, simple syrup). My favorite, owing to my weakness for spicy things, was the Chile and Passion Fruit Martini from the Hotel Principe di Savoia in Milan. Anyway, among the people I met at the party was a young Dorchester representative from Moscow. She expressed cynical mirth at our fretting over this economic downturn. Having a memory that goes back before 1999, I knew what she was talking about. Russia’s economy was thrown into absolute chaos in the early 1990s, when the formerly controlled economy was thrown open, destroying the currency and in general causing economic turmoil the likes of which I don’t think we’ve ever seen in the West. I mean, in the United States we had 25 percent unemployment during the Great Depression, but I don’t think it compared to the Wild West-style chaos of Russia in the early 1990s. And that was a piece of cake for them in the grand scheme of things. Russians resorted to cannibalism both during the World War II siege of Leningrad and during the Soviet civil war of the 1920s. I recounted this to the Russian, who didn’t contradict me, so I’m going to go ahead and assume that I got it right. You think you got it bad? Just remember, your neighbors aren’t trying to eat you yet. I bet you don’t have a model of a defibrillator on your desk. Well, I do. It’s an exact replica of the Medtronic Virtuoso™ with Conexus™ Telemetry that gets installed into people whose hearts have a tendency to stop beating. The defibrillator gives the heart a little jolt and the patient continues to live. My new friend Jennifer Watson sells them and she brought one to dinner for me to have. It's missing the Virtuoso’s guts, but it looks the same. Or so she says. I wouldn’t know, really, but is that something to lie about? Jennifer doesn’t just sell defibrillators. She watches the doctors install them to make sure they attach them right. Because it’s important. And she loves eating. She loves it! She has no interest in cooking, though. Chefs have flirted with her, hoping to seduce her with the allure of a private lesson, but that is not the right approach for Jennifer. I’d told her about Rhong Tiam, my favorite Thai place in the city, and she thought our eating there together would be a good idea. And indeed it was, as Jennifer has possibly a higher threshold for spicy food than I do, and thinks eating is just about the greatest thing in the world to do. So she gets up early in the morning to work out to make up for it. Me, I just eat. I used to go to the gym regularly, but when I stopped going and the world didn’t end I realized I didn’t have to go, and I find it hard to work up the motivation to do so. At least if I ever need to have a defibrillator installed, I’ll know what it looks like. 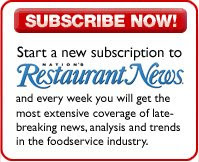 Today is my 10th anniversary at Nation’s Restaurant News. Can you believe it? I’m pretty sure Davids and Michaels and Saras get no thrill from that kind of conversation, but there just aren’t that many Brets out there, so we do derive a fair amount of joy from meeting one another, even when we stand on opposite sides of the fence when it comes to the number of 't's we use. Brett in this case was the bouncer at Little Branch, keeping a line of people, well, in line with gracious authority, even in the cold February air. Not me, though. I just went right in, as my friend Jim the goose man was already there, and I was expected. In retrospect I feel bad that Little Branch was my third stop in the evening, because it is supposed to be one of the great cocktail bars of the city, and I had been out way too long to care. It was dumb of me not to pay attention. I had come from the Hall Company's 13th anniversary party at Pulse Karaoke Lounge and Suites, where I sang "Sweet Caroline" with my boss, Ellen Koteff, and Stephen Hall's business partner Sam Firer, and assorted others who came on stage because "Sweet Caroline" is a crowd pleaser. I also chatted with Ed Witt and expressed sympathy that his restaurant Bloomingdale Road had just closed. And I drank Maker's Mark on the rocks. It seemed reasonable and proper to continue with the same theme when it came to drinks at Little Branch, where I also ordered whiskey on the rocks from our booth. They asked me what sort of whiskey. I said I didn’t care. And that’s true, but Jim had likely told them he was bringing the food editor of Nation’s Restaurant News and I imagine they wanted to leave a good impression. For me to be dismissive of their stock-in-trade was wrong. In fact, they gave me a tasty whiskey cocktail that was wasted on me because I was focused on discussing goose fat with Jim and a new acquaintance of his, animal fat enthusiast and jazz musician Jon Burr. My apologies to the nice bartenders of Little Branch, whose drinks deserve more consideration. Jon was playing the bass at the bar that night and Jim and I were there ostensibly to listen to him play. But we were really there to talk about animal fat, and ways for Jim to market the rivers of goose grease that are soon going to be available for consumption. Now that’s interesting, because the evening began with fat. For the first time, I had been invited to an event specifically as a blogger. Iron Chef Cat Cora was going to be there. Those two facts were interesting enough for me to go to the event. It turns out that Ms. Cora is now working with bigfatlie.org, which is an attempt by Lever Brothers to promote its “soft spreads” new-generation non-margarines that they’re promoting as heart-healthy and convenient. They’re certainly trans fat free, and convenient. Cat did a cooking demonstration of baked wontons, brushed with one of the soft spreads beforehand to make them crunchy. I personally would rather eat deep-fried foods, but less of them, but to each his own. The highlight of the party was the fact that Sara Bonisteel was there, recently freed from her job with Fox News and now working for AOL. I also met a new work colleague of hers also named Sara (or maybe Sarah, I didn’t ask). So finishing out the evening with fans of animal fat (and fiber, Jon’s also very big on fiber) balanced it all out well. Boy, it was hard to find a place to eat lunch yesterday. Egg man Howard Helmer had asked me to have lunch with him and the president (and I believe the only member) of the National Goose Council, Jim Schiltz. We had planned on eating at Bistro Desaret, because it’s near NRN’s offices and because Howard likes the kind of homey French food that they serve. But Howard had found out the day before that they no longer served lunch on Mondays, due to the fact that no one was eating there even if they were open. So we planned on lunch at the Japanese noodle shop Menchanko-Tei, near Howard’s Midtown apartment. So we went across the street to the La Bonne Soupe, a neighborhood favorite with a croque madame that Howard loves. The place was quite busy, but a table was available for us. Howard had his croque madame, Jim had a daily special of red snapper in red pepper coulis, and I had brandade de moroue. And Jim explained that he had developed a new process for harvesting his geese that got him a lot more USDA-approved goose fat than he did previously. He figured it out during the end of last autumn’s harvest cycle, so now he has 6,000 pounds of goose fat for sale. Most years he has 2,000 pounds. But this is the big news: Next year he’ll have 80,000 pounds of the stuff, and he plans to undercut the duck fat merchants by selling it for $2 a pound. Duck fat usually wholesales for about $3 a pound, he says. Goose fat is most famously used in the French dish pommes sarladaise, which is basically potatoes fried in goose fat. It’s something you should try sometime in your life, maybe every day. But it’s a wonderful frying medium for all sorts of things, and soon it will be available cheap. Hurray! Today for lunch I had smoked goose breast at my desk. My friend Ben Weinberg blew into Denver in 1982 like a force of nature. The gregarious 17-year-old high school junior from Minneapolis was instantly popular. He made the soccer team, became president of our youth group chapter, and had bright and pretty girlfriends. The way he tells it, his friends from back home would not have recognized him. In Minnesota he had been shy and bookish, but the mid-high school move to Colorado gave him a chance to reinvent himself, and that’s just what he did. His success thrilled him. I remember him telling me so after he was elected president. I was delighted, too, as Ben was my idol — he was popular and two years older than I, and yet he deigned to talk to me — and it seemed I had chosen wisely. We lost touch, as you do. Ben’s life took a circuitous route, but he found himself in corporate law and then financial planning. He hated it. So a few years ago he reinvented himself again. Taking an approximately 93 percent pay cut, he quit his financial planning job and started work in a wine shop. Since then he has achieved reasonable success as a wine writer. Last week he was sitting across from me at Zereoué, giddy as a 17-year-old who had just reinvented himself. He was being put up at the Waldorf=Astoria to attend an Italian wine conference, meeting all the big national wine writers and tasting as much Barolo as he wanted. Ben’s not my idol anymore, because I’m no longer 15, but I’m still delighted. Amos Zereoué, the owner of the restaurant we were in, had to reinvent himself, too, as he used to be a professional football player — a career with a limited time span. He bought the restaurant space that once housed Frère Jacques (13 East 37th St.) and reopened it as a French restaurant called La Gorge d'Or. Generic French food wasn’t working for the place, so he closed it and reinvented it, renaming it Zereoué, and adding themes of his native Ivory Coast into the food, décor and music (Zereoué was raised on Long Island, but he’s originally from West Africa). My buddy Chris Shott over at The New York Observer wrote about the restaurant being reworked last June, and since then, the place still hasn’t gotten much press or business. Slowly the food has gotten more and more West African, which surprises me, because there’s very little West African food in New York, and what of it there is in Manhattan is mostly north of 115th St., and I pay attention to West African food. It’s had a special place in my heart since my Ivorian friend Fatou cooked it for me. And yet I didn’t know anything about Zereoué. The food there is pretty West African. It’s toned down spice-wise, to be sure, and tarted up a bit in presentation, with little domes of rice and attieke instead of heaping piles of it, but it’s still distinctive enough that there’s nothing like it for miles and miles around. Ben said it was the best meal he’d had on this trip to New York.